Doug Sahm a/k/a Sir Doug was both a Texas rock & roll legend and pioneer. True, there were others before him (Buddy Holly and Roy Orbison come to mind), but the Sir Douglas Quintet counterattacked the British invasion of the mid 1960 s with their own brand of Chicano-influenced rock that they had been playing around their hometown of San Antonio. Wearing their tight-fitting English-looking suits, they hit the charts with She s About a Mover in 65, riding the waves with Doug s incessant guitar twangs and Augie Meyer s much-imitated, two-to-a-beat Vox electric organ chords. 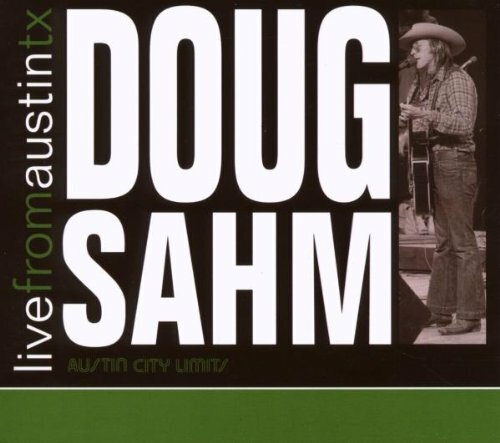 This performance, recorded October 14, 1975, came after Doug had temporarily retired the Sir Douglas name, but features original member Meyer along with musical compadres Martin Steitle, John Barber, Steve McDaniels and Harry Hess. All the Sir Douglas Quintet classics are here, including Mover, Mendocino, and Rain, and Doug ventures into other musical territory ranging from T-Bone Walker to Bob Wills. Long before the Quintet, Doug had been making music since even before the birth of rock & roll. He began his career as Little Doug, a guitar-playing prodigy who was invited to join the Grand Ole Opry when he was only 13. Over time, with the help of his irrepressible personality, he became a voice for Texas music, the original cosmic cowboy back in the hey-day of the Armadillo World Headquarters in Austin. But his influence went beyond Texas; in 1973 he even lured Bob Dylan out of hermitage to record with him, and Bob in turn invited him to join his legendary Rolling Thunder Review Tour. Doug left us suddenly in 1999, but he left behind a unique legacy, a Groover s Paradise indeed.